As Hurricane Florence approaches the East Coast, those evacuating might want to think twice before relying on a seemingly clever hack in order to tell if your freezer food went bad. A photo, dated Oct. 5, 2016, shows a quarter inside a coffee mug which is making its rounds on Facebook with over 230,000 shares and appearances on multiple news outlets. The claim written in the caption suggests to freeze a cup of water, then place a quarter on top of the solid liquid and leave it in your freezer. The assumption is that when you return to your home after being evacuated, you will be able to tell if your food went bad and refroze or if it stayed frozen. If the quarter is sitting in the middle or top of the cup, the post reads, then "your food may still be OK."
"If the quarter has fallen to the bottom of the cup that means all the food defrosted and you should throw it out," it says. The viral instructions may seem like a bright concept, but the FDA confirmed to "Good Morning America" today that this hack is not among the food safety tips that are listed here on their website. The Centers for Disease Control and Prevention also told "GMA" that people should not rely on the quarter in the cup method to determine if food is safe to eat. "Foodborne illness, or food poisoning, is a risk from food contaminated from flood water and from perishable food not held at a safe temperature due to power outages," the CDC wrote in a statement. "If foods of animal origin, especially raw meat and poultry, have not been held at a safe temperature, germs already present can grow to high numbers. Other foods not held at the right temperature can also spoil." -Thawed food that contains ice crystals can be refrozen or cooked. Freezers, if left unopened and full during a power outage, will keep food safe for 48 hours (24 hours if half full). -Throw away perishable foods (including meat, poultry, fish, eggs and leftovers) in your refrigerator when the power has been off for 4 hours or more. -Throw away food that has an unusual odor, color, or texture. When in doubt, throw it out. The FDA also has tips on how you can stay one step ahead. One is to freeze containers of water for ice that will help keep food cold in the freezer, fridge or coolers if you lose power. Watch out, America! 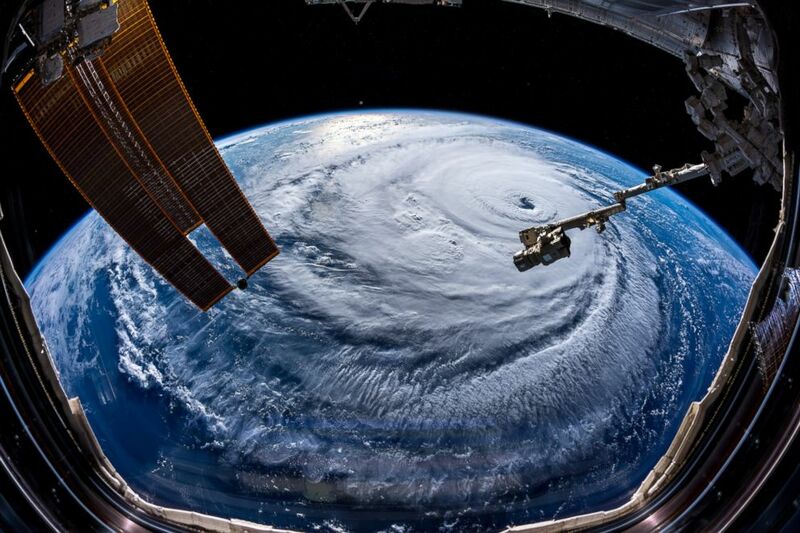 Hurricane Florence is so enormous, we could only capture her with a super wide angle lens from #ISS, 400 km directly above the eye. Get prepared on the East Coast, this is a no-kidding nightmare coming for you. In an article on properly "Keeping Food Safe During an Emergency," the United States Department of Agriculture (USDA) advises to "always keep meat, poultry, fish and eggs refrigerated at or below 40 °F and frozen food at or below 0 °F." The FDA has the same temperature guidelines listed on their website. The USDA also does not list the "quarter in a cup" hack on its site. It does however note that maintaining certain temperatures may be difficult when the power is out. Therefore, you should keep refrigerator and freezer doors closed as much as possible. "The refrigerator will keep food safely cold for about four hours if it is unopened," the article says. "A full freezer will hold the temperature for approximately 48 hours (24 hours if it is half full) if the door remains closed." If you assume the power will be out, try keeping dry or block ice in the fridge and or freezer. Fifty pounds of dry ice should hold an 18-cubic foot full freezer for two days, the USDA states. In addition, food may be safely refrozen if it contains ice crystals, or is at 40 °F or below. But be cautious and look over each item thoroughly. "Partial thawing and refreezing may reduce the quality of some food, but the food will remain safe to eat," the USDA says. For more on refrigerator and frozen food safety, read the USDA's recommendations on "When to Save and When To Throw It Out."